BROCKTON, Mass. - For O’Bryant, the Tigers feel it is their time. 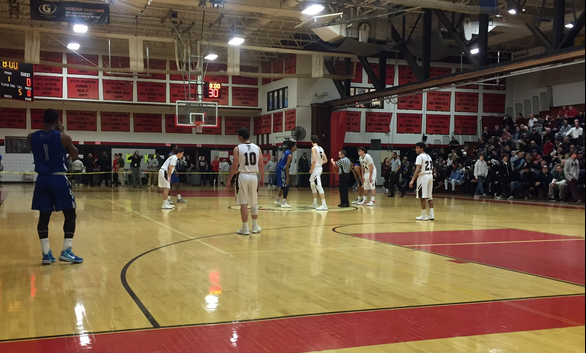 On Wednesday night, behind 22 points, 7 rebounds, and 7 assists from sophomore sensation Rivaldo Soares, O’Bryant clinched a spot in the Division 2 South Sectional Final with a 80-57 victory over Falmouth at Brockton High school. O’Bryant moves on to play Whitman-Hanson on Friday night in their first sectional final appearance since 2005. Tigers Coach Drew Brock said this has been his most fulfilling year as a coach. All evening long O’Bryant displayed an impressive offensive attack against the Clippers' 2-3 zone. When the Tigers were not drilling three pointers (11-for-21), they were often seen slicing through the top of the zone via dribble penetration before pulling up at the foul line or dishing the ball off to someone cutting along the baseline. In total, the Tigers’ had 10 assists off 14 made first half field goals, and by games end had 22 assists off 31 made baskets. That ball movement was on full display from the opening tip as two dump off passes from Soares to Romario Ebanks (17 points) combined with an Ebanks three pointer helped O’Bryant jump out to a 20-10 lead after one. Falmouth went on a run to start the second quarter as a basket by Jared Martino and an and-one layup for Eli Harris capped off a 7-0 run for the Clippers that pulled them within five. O’Bryant’s run and gun style of play, however, was just too much for Falmouth to handle. A corner three from Ebanks re-established the Tigers’ double-digit lead, and a pair of buckets from Uchenna Igbowke helped O’Bryant maintain a 35-24 advantage at the break. The second half was all O’Bryant. Soares poured in eight points in the frame, including two dunks over the final two minutes of the stanza to help the Tigers build an 18-point lead. At the other end of the floor O’Bryant stymied Falmouth with their full court pressure, causing the Clippers to take close to 10 seconds just to get it across half court. Once in the half court, the Tigers made up for their size deficiency against the Clippers six-foot seven-inch center Nicholas Crocker by sending four and even at times five players to the glass. The effort paid off, with O’Bryant outrebounding Falmouth by a 37-23 margin for the game. Out of those 37 rebounds, 11 were offensive which helped contribute to 15 second chance points. Falmouth attempted for one last ditched comeback attempt early in the fourth quarter when, after falling behind 21, Crocker threw down a two-handed and-one put back dunk to cut the deficit to 15. Emmanuel Exhilhomme, however, got those three points right back with a trey from corner, and Soares came up with four consecutive points for the Tigers to hand O’Bryant a commanding 75-52 edge in the games final moments.